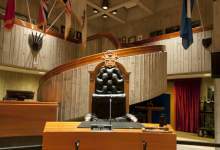 St. John's City Hall is where all of the policies and bylaws which govern our City are made. City Council meets once a week, typically on Monday at 4:30 p.m. in the Council Chamber on the fourth floor of City Hall. But throughout the week Council and City staff are kept busy with numerous committee meetings. Learn more in this section about your City Council, the committees which help guide council and all of the policies and bylaws which City Council has approved through the years.